Thank you for voting for Ironstone in 2017’s Best of London! 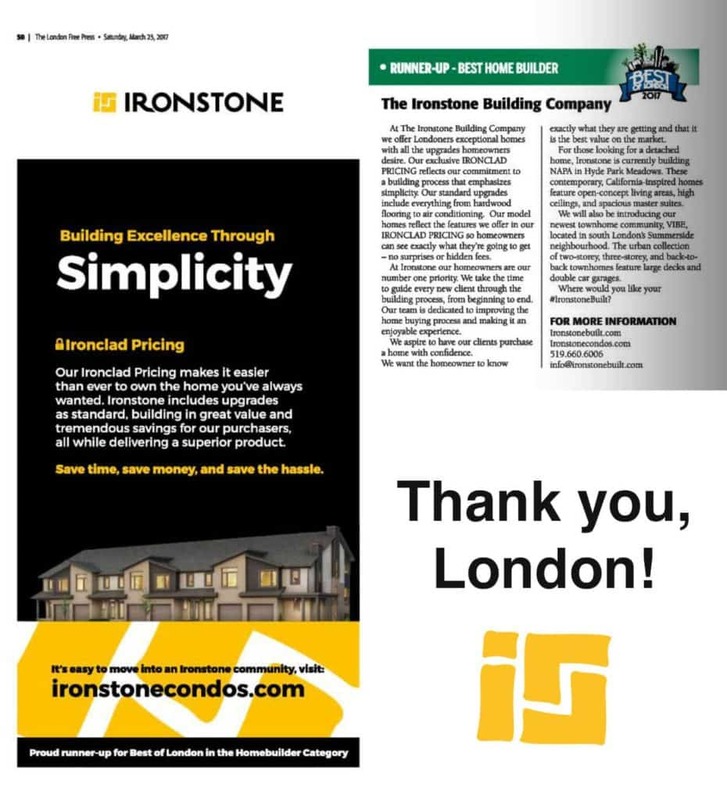 Almost 10,000 Londoners voted in the London Free Press’ Best of London survey and the results are in: The Ironstone Building Company is runner-up in the Best Home Builder category! Thank you to everyone to voted for us. We’re always striving to bring you the best value in the market while keeping the buying process simple. At Ironstone our homeowners are always our number one priority. We take the time to guide every new client through the building process, from beginning to end. Our team is dedicated to improving the home buying process and making it an enjoyable experience. Our exclusive Ironclad Pricing reflects our commitment to building excellence through simplicity. By including upgrades such as high ceilings and extra tall cabinets in our base prices, we’re able to pass our savings onto you while delivering a superior product. Congratulations to all the 2017 winners!